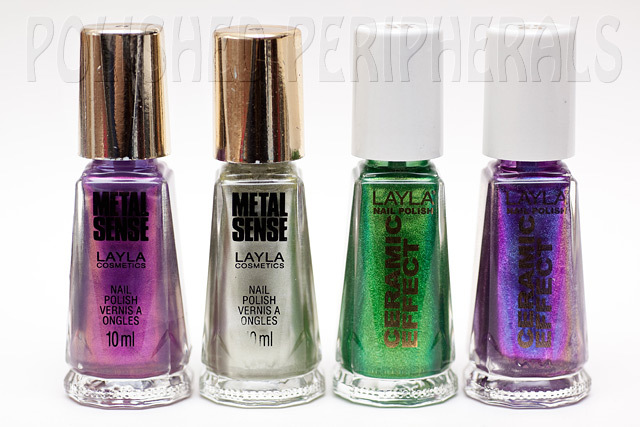 Polished Peripherals: Layla, you've got me on my nails. Layla, you've got me on my nails. This is Metal Sense #9 and #6 (or it could be the other way around if the lids are upside down, the numbers on the lid look the same) and Ceramic Effect #61 and #64. 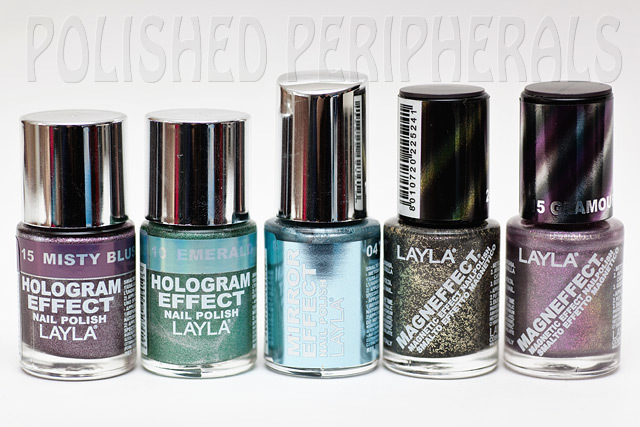 This is Hologram Effect #15 Misty Blush and #10 Emerald Divine, Mirror Effect #04 Titanium Sky, Magneffect #24 Starry Night and #15 Glamour Lilac. I'm pretty pleased with my choices. Of course the first thing I did was swatch them all on a nail wheel while deciding what to wear first (I should have taken a photo). These new Hologram Effects have a lot more colour to them than the old ones. 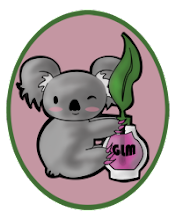 The green is actually quite similar to Nubar Reclaim in colour but with more intense holo and the Misty Blush is an amazing colour. 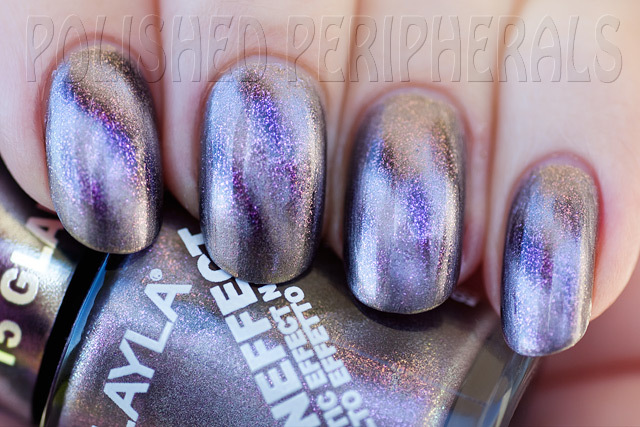 I think it's an aubergine purple but the holo rainbows are so strong it's really hard to identify just one base colour. The two Ceramic Effects and the Mirror Effect were exactly as I expected. I've seen photos of them on Cathy's blog and already have the silver coloured Mirror Effect, I just wanted the blue as well :) The Metal Senses were a bit of a gamble. I couldn't find much about them so just picked two that I thought might be nice colours. The purple one is stunning, it reminds me a little of Orly Fantasea just without the gold shimmer. The other, #6, is a soft gold metallic that shows brush strokes. Not sure what I think of it yet. It's similar to so many other gold metallics I have. The Magneffects were a gamble too. I already have some Layla magnetics that I love, a blue and a gold/brown, so I chose two that I thought would give me different colours and with shimmer for a different look. The Starry Night looks different to Layla's swatch photo, not what I expected so I'm not sure if I like it yet. It's almost black with gold glitter that dries to a rough bumpy looking finish. It doesn't seem to magnetise as well as the others I have and the bumpy glitter spoils the look of the lines. I need to experiment with it some more. The lilac one though is really pretty and it's what I chose to wear first. Glamour Lilac is an interesting colour. I'll call it gun metal grey with a lilac tint and pink shimmer particles. Without the magnetic the pink is mostly hidden. It's a sheerish polish so 2 coats are needed for opacity on it's own or 3 coats when magnetised. The magnet separates the pink shimmer from the grey and pulls it into lines which makes those pink lines sheer so I needed 3 coats to stop my nail showing through the pink. Interestingly though that sheerness means this can be used over coloured bases which show through the magnitised lines. I've tried it over blue and purple. The effect is subtle but enough colour shows to change the look. For this mani though I just used 3 coats of Glamour Lilac. The magnet on the lid of the Layla Magneffects works well. I tested other magnets, including some homemade versions, and the Layla worked best. I had trouble getting the lines to wrap around the curve of my nails but that's a problem I always have. The lines look much more obvious and neater in real life, the camera couldn't pick them up clearly with all the sparkle and reflections. When I added top coat it smeared the grey/silver bands over the pink :( I tried 2 different top coats and 'floated' it on and the polish was completely dry but it still smeared. From memory I had the same problem with the older Layla magnetics. Wow Starry Night looks so good. Is that a new Magneffects? I don't remember ever seeing it on the display in the shops that sell them. I have the same problem, my nails are too curved, I have noticed the longer I held the magnet the more it works. Although I can NEVER get right thumb to work! YAY! This order looks awesome, I resisted and only decided to get two of the mirror effects and I can't wait to get them! !